Audio products manufacturer Divoom presents the Divoom Bluetune Bean Portable Pocket Sized Bluetooth Speaker. It is an ideal buy if you need an external speaker to replace the built-in speakers of your portable digital media device. The Divoom Bluetune Bean Portable Pocket Sized Bluetooth Speaker is a radical departure from the traditional box-and-cylinder design of portable speakers, the bean/dome-shaped unit not only fits in your pockets. It can also fit comfortably in the palm of your hand. The Bluetune Bean comes with Bluetooth technology, meaning that you do not need wires or cables to connect it with another audio device. The Divroom speaker is compatible with all Bluetooth-enabled devices, which include laptop computers, smartphones such as the iPhone and Samsung Galaxy S4, and tablet computers like the iPad. 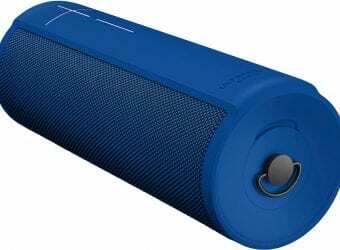 Made of plastic, the Bluetune Bean is nevertheless toughened with a rather thick silicone rubber layer, which engulfs most of the speaker's exterior build. The only part that does not have silicone is the bottom. At the face is a collection of hundreds of holes of varying sizes for allowing sound to pass through into the open. At the top of the Bluetune Bean is a protruding aluminum loop. This provides the ability to clip a metal carabiner onto it, thus allowing you to hang it out of a bag. The speaker has two buttons, each on one side of the unit. One of them is the power button to turn on the speaker, while the other is a button to turn on the speakerphone function. Accompanying the unit's speakerphone capabilities is a tiny mic, which enables you hands-free operation of a phone. A small rubber door at the bottom of the unit conceals a USB port for connecting it to USB-compatible devices. For power, the Bluetune Bean relies on a built-in rechargeable battery that provides up to 6 hours of play time on a full charge. Weighing only four ounces, the Bluetune Bean has a length of 3.5 inches, width of 2.75 inches, and height of 1.75 inches. The unit is available in six colors: black, blue, pink, red, white, and yellow.